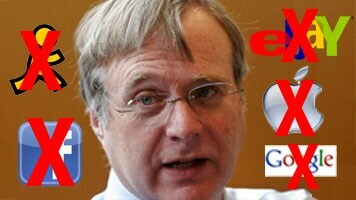 Microsoft Co-Founder Paul Allen Sues Apple, AOL, Google, Facebook and… forget it… I’m running out of room! Goliath is going after a whole gang of Goliaths. Microsoft co-founder Paul Allen is suing web giants Apple, Google, AOL, Facebook, eBay, Yahoo, YouTube and three of the nation’s biggest office supply stores (Office Depot, OfficeMax, Staples) alleging they infringed on web search-related patents his company, Interval Licensing, holds. Allen filed the lawsuit in Seattle on Friday. He’s seeking unspecified damages. Interval says that it holds patents on web-search technologies it developed in the early 1990s, and that the 11 companies named in the lawsuit violated those patents while developing their search and e-commerce businesses. It’s hard to see how Allen would own the “technologies” claimed the patents, as they are more or less fundamental to how the internet works. Next Next post: Sure, you can spend the night… but first let me see your Foursquare STD badge!